I’m not a real fan of bananas but this recipe is really awesome and the caramelised flavour really does make the bananas taste really good. I tried out this recipe and it was seriously easy to make. The ingredients are also readily available. Remove the label from the tin and immerse the whole tin in water completely and bring to boil. Make sure the whole tin is in water otherwise it will EXPLODE! (Experience speaking…!) Boil it on low heat for at least 2 to 3 hours because the thicker this mixture the better. Crush the biscuits into a fine powder, add the melted butter and mix it well. Press it to the bottom of a springform tin and settle it down with a fork and make sure there are no air spaces when you’re pressing it down. If you don’t have a loose-bottom tin then whatever utensil you use, line it with clingfilm. Stick it into the fridge to chill the base. Whip the cream in the meantime. 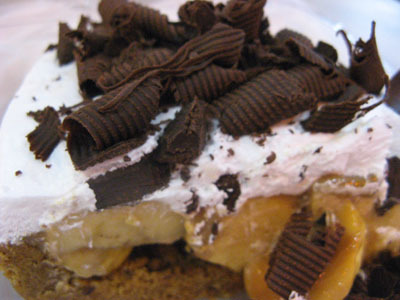 When the base has chilled well, remove it, layer it with cream, bananas, cream and then loads of grated chocolate on top. By the way I use a butter curler to grate the chocolate. Gives a nice swirly effect. Kamo, I was just thinking of sending you a yummy easy recipe for banana muffins. Made them yesterday and they were delicious! !